We've been hearing a lot about a potential mini version of the LG G3 and today it's become a reality in the form of the LG G3 Beat. The fact LG has followed in the footsteps of the HTC One Mini 2 and Samsung Galaxy S5 Mini is no surprise, but the sheer size of the G3 Beat is sure to raise a few eyebrows. 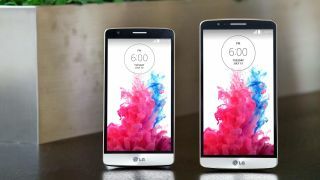 That's because the LG G3 Beat sports a sizable 5-inch 720p display - the same size as the One M8, but lower resolution - dwarfing the 4.5-inch offerings on its rivals. It also packs a 1.2GHz quad-core Snapdragon 400 processor, 1GB of RAM, 8GB of internal storage, microSD slot and Android 4.4 KitKat. Round the back you'll find an 8MP camera which inherits the laser auto-focus of its bigger brother, while on the front you get a 1.3MP snapper. The 2540mAh battery is larger than the HTC and Samsung competition, but the G3 Beat is also larger than both at 137.7 x 69.6 x 10.3mm - although there's very little between it and the One Mini 2 thanks to the slender bezel around the screen. The LG G3 Beat release date is pegged for July 18 in South Korea, and will then rollout globally in the following weeks including Europe and the Commonwealth of Independent States. Pricing is currently unknown, but LG has made a point to say that the G3 Beat is a mid-tier smartphone so we'd expect it to match the competition in terms of cost.